Today is World Refugee Day, and nothing is a more grim reminder of the inhumane treatment of those seeking asylum in other countries than the situation developing right now in the United States. This week, it has been revealed that almost 2,000 children as young as those at toddler age have been separated from their parents at the southern border and held in conditions akin to a prison. The news follows a change in the country’s immigration policy when the Attorney General Jeff Sessions announced a “zero tolerance” approach towards every person caught crossing the US-Mexico border illegally. It’s sparked worldwide criticism from UK politicians Jeremy Corbyn and David Lammy and even those within his own party. Former First Lady Laura Bush compared them to internment camps, others have dubbed them modern day concentration camps. 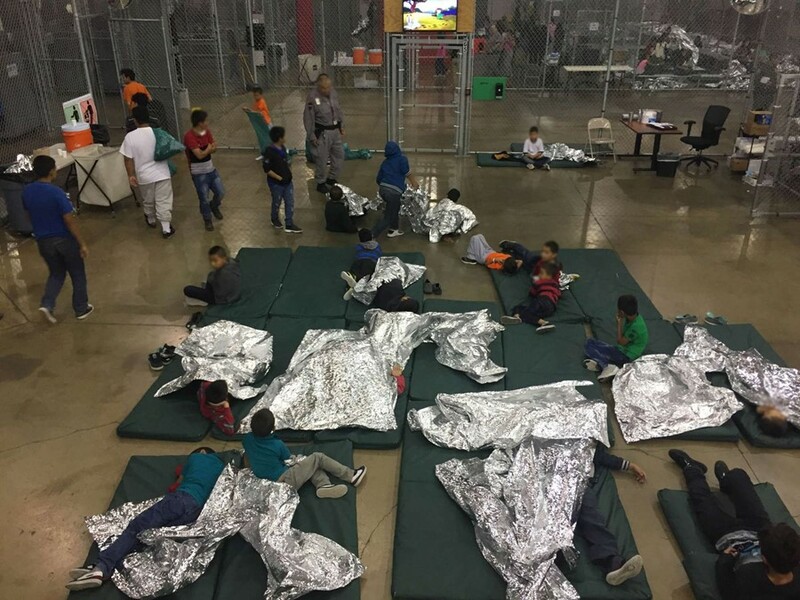 Images and reports have surfaced of crying children held in cages, while audio shows the children are distressed and asking for their parents and relatives. Predictably, Donald Trump defended the practices on Tuesday, so here are some ways to put pressure on him and his administration and end this cruelty. Amnesty International have called the process “spectacularly cruel” and “nothing short of torture”. They are calling on the Trump administration to immediately put an end to this unnecessary, devastating and unlawful policy of forced separation, and to reunite families that have already been separated as quickly as possible. They’ve launched an online campaign which spokesman Neil Durkin has encouraged all those concerned to take part in. The online form will send a letter to Kirstjen Nielsen and demand that the department put an end to the separation of families. Your Senator works for you, so if you’re angry about this situation then it is your democratic right to let them know. You can make your voice heard by calling and demanding change. You can either call 1-202-224-3121 or use this specially created ACLU page to be directed to the correct representative and the site even includes a script of what you can say to the staffer who picks up the call. For any Dazed readers who also happen to be a legal service provider in the South, ProBAR and other legal organisations, are doing a lot of work with immigrant children and families, and have volunteering opportunities available for attorneys, law students, legal assistants and interpreters. You can find out more about that here. Okay, so this one requires close proximity, but Nielsen was driven out of a Mexican restaurant today by activists who heckled her. “How dare you eat a Mexican dinner as your department is imprisoning tens of thousands of people seeking asylum in the United States,” one of the protesters shouted as she puts her head down. “If kids don't eat in peace, you don't eat in peace,” shouted another. Politicians who make the decisions to put children through hell shouldn’t be sheltered from your anger and so if you see them, tell them. It’s important that everybody knows what is going on so that they can also put pressure on government officials. However, if you can’t find any credible source for a claim, don’t bother sharing it. Take your voice to the streets and organise a public protest to make it clear that you won’t stand for this. There have been rallies outside US embassies in cities as far as Madrid and you can plan your own via social media. Alternatively you can text ‘Belong’ to 97779 to keep up with action happening to near you.